Measurements: 3.15 x 4.3 inches, or 80 x 110 mm. Back of card: Blueish-white, with squarish scrollwork. May be inverted. Booklet included: Yes, 48 pages, 2.95 x 4.05 inches, or 75 x 103 mm. Instructions in English. Publisher: US Games, Inc. Printed in Italy. Comments: This is Nathalie Hertz's third deck. While she was painting it, her two children were born. In particular, while working on The World, trump XXI, she found she was pregnant with her first child. She imagined the child to be a girl, and worked to express that on the card. Some time later she got scanned and found she was right. Suits in this deck represent the four seasons: Swords are winter, Wands are autumn, Pentacles are summer, Cups are spring. The booklet, while small, is well-written & detailed. 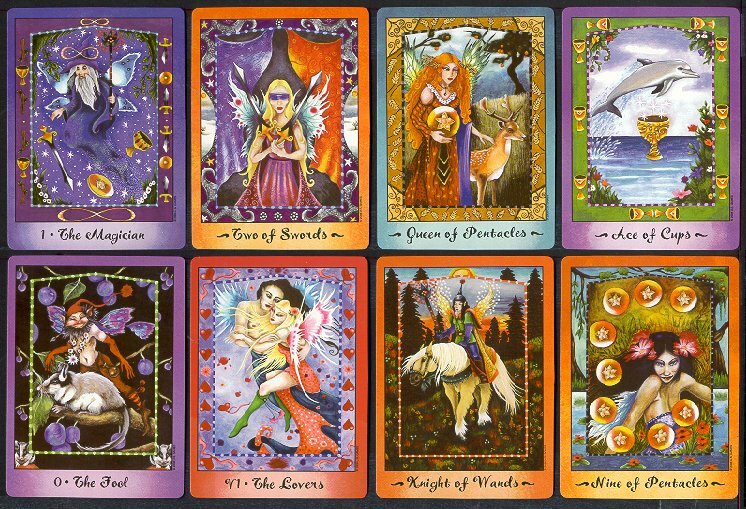 Each card has an introduction that relates to the image on the card itself, as well as meanings both upright & reversed.